This 1981-82 UEFA Cup tie brought a familiar face back to English football, as Malcolm Allison took his Sporting Lisbon side to The Dell to face Lawrie McMenemy’s Southampton. 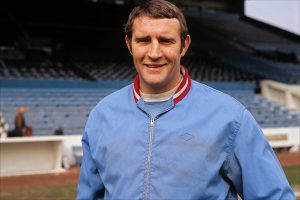 Allison had been assistant manager of Manchester City from 1965-71, taking charge of playing matters under Joe Mercer, the club’s veteran manager. This was a highly successful period in Manchester City’s history, as they won four major trophies including the 1967-68 League Championship, their last until the current era. After Allison’s playing career was cut short by tuberculosis in the late 1950s, he became interested in coaching, adopting methods from the Soviet Union, having seen the Red Army side training whilst on National Service in Austria. He is now regarded as having been ahead of his time in his emphasis on physical conditioning and diet, as well as a tactical pioneer. His image as a flamboyant and outspoken character belied his innovative methods; City goalkeeper Joe Corrigan recalled his focus on “players’ diets, physiotherapy, weight and sprint training.” He took over at Manchester City in 1971 after Mercer’s acrimonious departure, but was unable to replicate his previous success and a later return to Maine Road in 1979 was even less productive. It was with Sporting that he won his final major trophy, the Portuguese League in 1981-82, which remained the Lisbon club’s last title until 1999-2000. Meanwhile McMenemy, having guided Southampton to FA Cup victory as a Second Division side in 1976, then took them to promotion two years later. He established Southampton as a force in the First Division on a limited budget, integrating young players such as Mark Wright, Steve Williams and Danny Wallace with experienced internationals in Alan Ball, Mike Channon, and, later, Peter Shilton. His most spectacular signing was Kevin Keegan, who returned to English football from Hamburg in the summer of 1980. 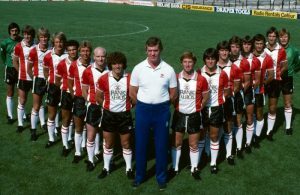 Southampton finished sixth in 1980-81, securing the club’s first European campaign since 1977, and topped the First Division in January 1982, eventually dropping to seventh. McMenemy took them to second in 1983-84, which remains their highest-ever League finish. It also proved the high-point of McMenemy’s managerial career, as he left Southampton in 1985 for an ill-fated spell at Sunderland, who made him the Football League’s highest-paid manager at the time. He assisted Graham Taylor during England’s doomed attempt to qualify for the 1994 World Cup, and ended his managerial career with Northern Ireland in 1999. Arsenal went out of that season’s UEFA Cup at the same Second-Round stage as Southampton. With Ipswich Town and West Bromwich Albion already out, the only remaining British representatives were Aberdeen, conquerors of Ipswich in the First Round, and Dundee United, who eventually reached the quarter-finals. The trophy was won by IFK Gothenberg, the first-ever success for a Swedish side in European competition.